Owners of Apogee Acoustics speakers however will likely know what this is about. 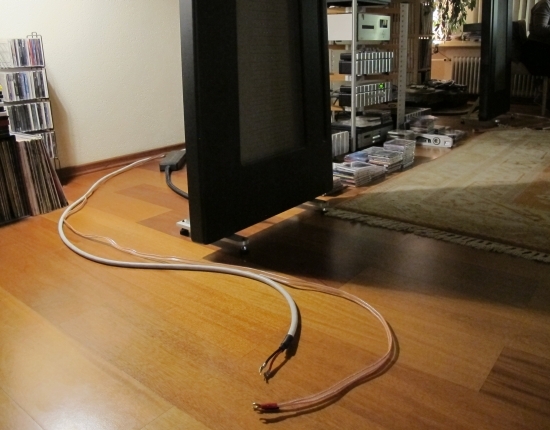 Here’s a review of the two cables that Swiss company Symo made apparently especially for Apogee. I actually don’t know a great deal about the history of these cables but what I do know is that the LS4X twin lead cable was used by magnetostatic speaker manufacturer Apogee Acoustics for their Diva model, between external crossover and speaker. 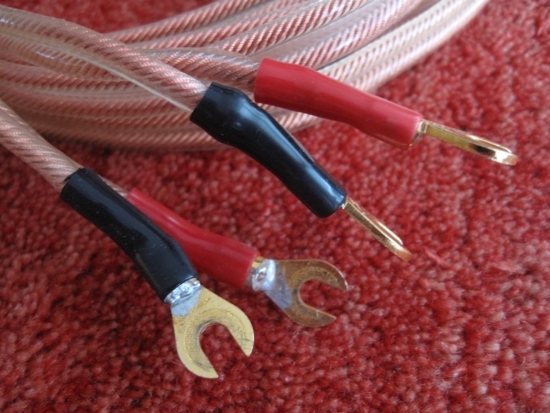 The cable drew my attention when I read in an article that apparently the Diva wouldn’t sound very good, until it was hooked with the very same cable from amplifier to crossover box. The reviewer in the article was perplexed at how much difference this seemingly nondescript cable made. Thing is: the LS4X may seem like an ordinary, albeit heavy gauge (large diameter), litze cable, but its construction is really rather complex. The conductors are actually identical – the only difference is in the addition of some thick white PVC outer sleeving in the case of the LS5SX. The LS4X only has one layer of thin transparent PVC. Another difference is that the LS5 SX’s two conductors are placed closely together where the LS4X has them separated more. 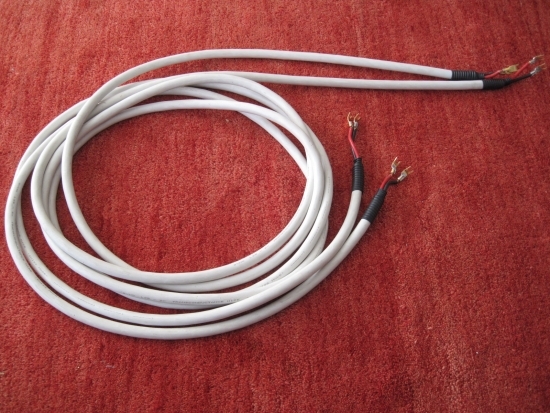 Both Symo cables consist of a mixture of solid core and litze wire. The core is made up of a few solid core wires (I forget how many, I believe 4), around which another 6 solid core wire are wound, but with a twist: around these outer solid core wires are very fine, individually coated, litze wires. The wind of the litze is very tight and almost perpendicular to the inner core. 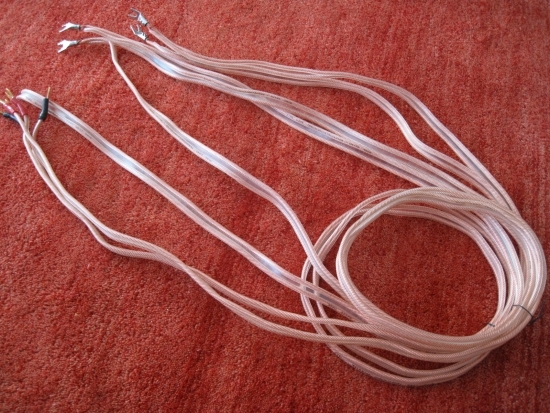 Therefore, the litze wire will have a far greater length than the inner wires. Perhaps this is something to do with the idea that high frequencies travel faster and have to be slowed down, or something. I’m just guessing here, but really the underlying theory doesn’t interest me that much, as long as the cables sound good. But do they? I’ll get to that in a minute. But first a word about termination. In standard form, the cables come with factory-fitted Monster spades that aren’t bad at all, it’s just that their small gap space only allows them to be connected to the original Apogee spade connection terminals, it seems. They won’t fit Cardas or WBT binding posts. It is possible to solder connectors to bare cable ends but you first have to get the coating off the litze. If you don’t then you risk making a half-baked connection. What you need is either a proper soldering iron (40 watts at least), some S39 (soldering acid) and a lot of patience, or a more professional solder-pot. Of course I didn’t have a solder pot so I went with option one. But hey, it will work. I’ve compared both Symo cables in my own set up as well as in JW’s setup. The comparisons were carried out versus Transparent Reference XL and van den Hul Skyline Hybrid. When used with the Diva, LS4X sounds fuller and more colourful than Skyline Hybrid, with a deeper, more sonorous bass. However, the van den Hul edges it with more airy treble and an overall more refined sound. Also, the LS4X doesn’t image very well, there’s more of an “overall” feeling, rather than pinpoint imaging. However, the LS4X sounds very lush and has wide and deep imaging, and it does indeed make for some mellowing of what with Apogees in a wrong setup could be a hard/edgy sound. In this case however the result was a more friendly sound with a lively, upbeat and “live” character but trailing behind a little in terms of low level detail. The Skyline Hybrid sounds just as upbeat and engaging but offers better resolution and greater overall transparency, albeit with less “meat on the bones” and with a much leaner bass. 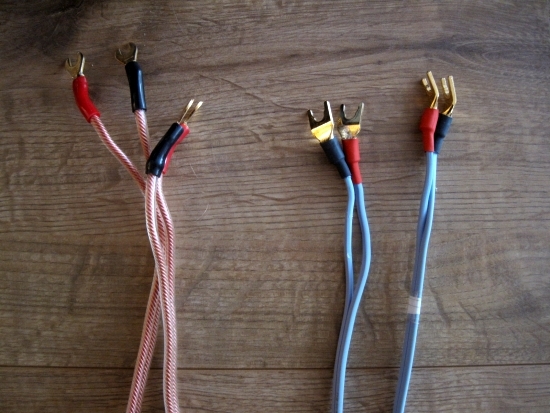 Which of these cables will eventually sound better in your system will be very much a matter of system synergy. LS5 SX is another matter. Perhaps it was due to the badly soldered connectors (cold weld perhaps) or simply down to the two conductors being much too close to each other as well as being covered by two thick PVC layers, I can’t say. But the net result in my system at least is that the LS5 SX sounds dull, thick and slow. It’s got compressed dynamics, sounds dark and soundstaging is confined to the speakers. The sound doesn’t breathe. The only thing you could say that the LS5 SX has got going for it is that in comparison with the van den Hul Skyline Hybrid, it sounds fuller and more romantic. But that’s only a very partial success and on all other accounts it just doesn’t sound very good. This section of the review was carried out in the system of my listening buddy JW. This is admittedly a very unfair comparison as the Transparent cost around 12.000 euro new, and around 4000 euro second hand, which is ridiculous money indeed. Still: in audio all is relative and it has to be said that the Transparent can be beaten in certain areas. van den Hul Skyline Hybrid for example sounds more airy and has a fresher, more upbeat feel while avoiding any harshness. However its soundstage is narrow, timbre is nowhere near as full as the Transparent’s and its bass obviously can’t touch the Transparent’s. The Symo LS4X surprisingly actually comes closer to the Transparent XL in certain aspects: it has the same overall sonic signature in terms of luxurious richness and fulness. And incredibly the Symo actually beats the Transparent in outright midrange- and upper bass slam, sounding more “live”. But of course the Transparent in turn beats the Symo again in soundstage imaging and -layering. The Transparent is simply master in that department, as well as in deep bass. Then there’s the matter of microdetail: while the vdH is still impressively detailed, the Symo clearly stays behind, painting a broader picture. Importantly, the LS4X does sound immediately emotionally convincing. The Symo LX5 SX again disappoints, managing to sound dull and agressive at the same time. In all fairness, part of this I think is due to the badly soldered connectors but the dullness itself I fear is down to its design, using lots of PVC. But I can’t be sure until I replace the connectors myself and unfortunately, that I cannot do, as it is a loaner cable. So please take the LS5 SX comments with a grain of salt. Transparent can cause confusion with their naming so please note: there is a distinction (in price, too) between Reference XL SS and Reference (with XL technology). The former has smaller metal network boxes and the latter has larger plastic network boxes. The former is what I use and the latter is what JW uses in his setup. Moving back to my own system, the Reference (with XL technology), the cable I use myself, clearly sounds more lively and upbeat than the Reference XL SS. The latter however is smoother and more luxurious and forgiving and works well in JW’s system, but sounds too relaxed for my system. While the LS4X sounded particularly more “live” than the Transparent Reference XL SS in JW’s system, in my system the Transparent Reference (with XL technology) overall sounds just as lively. And this time, the LS4X doesn’t offer any improvements over my own cable. 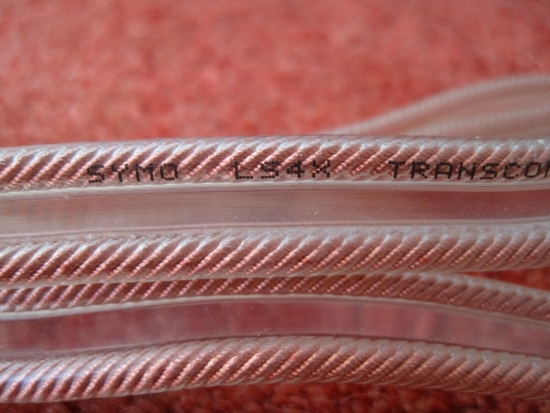 Still: good score for the Symo LS4X, for coming so close to the much more expensive Transparent cable. Symo LS4X is a very nice cable with a similar tonal character as Transparent Reference XL SS and Transparent Reference (with XL technology. While more upbeat and “live” than the Reference SL SS, the more lively Reference (with XL technology) compensates for this and levels the field in the dynamics department. Either Transparent cable has better deep bass, soundstaging and layering than the Symo. But, this comes at a price. I’d say if you’re looking for an excellent cable that approaches the Transparent sound for very little secondhand money, the Symo LS4X is a great choice. Don’t however expect the Symo to open up new worlds in the detail department, it won’t. 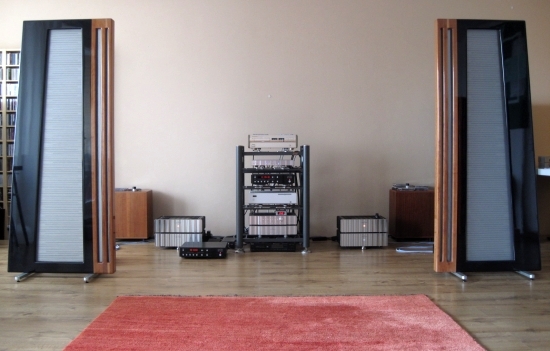 But it does indeed match very well with Apogees, making them sound fuller, friendlier and smoother. van den Hul Skyline Hyrbrid is simply a steal at its super-low price of 7 euro per meter. It offers well-paced sound with excellent dynamics and open, fluid treble without sharp edges and it really only loses out in soundstage width and depth, (bass-) fulness and tonal colour. 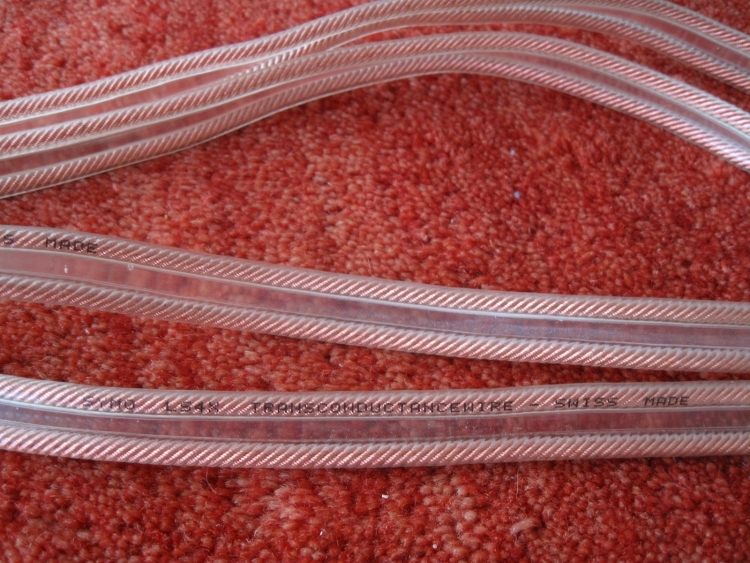 Transparent remains my brand of choice but I have to state clearly that they are not universally applicable cables. Oftentimes you have to take countermeasures elsewhere in your system for Transparent to work well. Symo in that respect is much more of a universal cable. hi, you think the vdh skyline is better then the audioquest flx 14/4. they say its another verry good budget cable. thank you ! I haven’t heard that AQ type so can’t really say. Likely it’s not a matter of one or the other being better per se, but they’re probably have different characters. At this end of the cost spectrum I would suggest to just dive in and get both cables, and try for yourself. 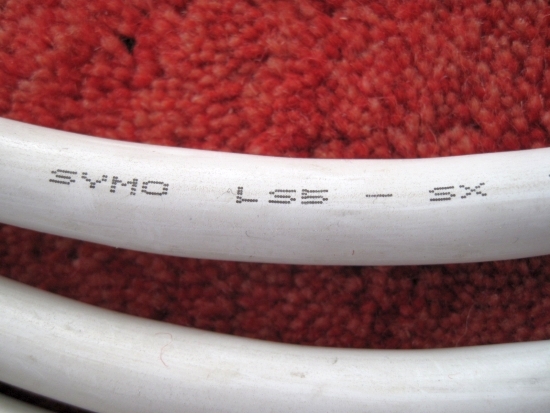 I have had Symo LS5 SX cable with my Grand Divas since about 1994. The cables have worked beautifully and have never had a moments desire to change them out. Jason Bloom introduced it to me when I ordered my Divas. Symo is the premium audio cable in my book! They are fine cables indeed. One just has to make sure that when terminating them, proper methods (Solder Pot) are used to avoid half-soldered brittle connections to spades or bananas. BTW you say Grand Divas? Is that a Diva with a dynamic subwoofer? I am not aware of this type. Could you send me some pics and specs please? 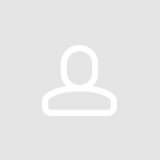 If you leave your email addres I can share my private mail. Hoi Christiaan, heb je de Symo LS4X nog? Is die te koop? As a generic update: I do still have and use Symo cables, but am not selling them. As my go to guy for all things Apogee Acoustics, the real question is whether I should be on the hunt for these going forward. Right now, I’m using 15-20 year old Audioquest Midnight Blue Hyperlitz bi-wired speaker cables. Should I switch them out to equally old (at least in terms of their heritage) Symo cables? Will it really make that much of a difference? Some say, stick to Jason Bloom’s recommendation many years back that these match best with Apogees (in my case, Centaur Majors), while others say cable technology has improved substantially since Jason’s day, and to look elsewhere. I get the sense you fall in the former camp (i.e., get the Symos) but would like to get your thoughts. All cables sound different, the question is if this particular difference is the change you are looking for. I have no experience with older AQ cables, only with the latest ones. These sound very tight, energetic and forward, quite the opposite of the Symo sound. Centaur Majors are quite forward sounding themselves, relative to Duettas and certainly Divas. It is no stretch to conclude that Symo was recommended due to its softening effect. Let me put it another way. 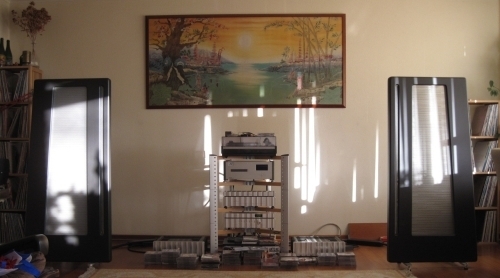 If you’re looking for more detail, more air, or more of any typical audiophile quality – Symo likely would not deliver. If you are looking for a synergistic smooth, tonally full sound, then you might want to try and obtain some Symo yourself. An alternative for a similar sound (but better audiophile aspects) might be to try Transparent Reference, but that will be considerably more expensive. Cable technology has advanced, sure, but have cables really become so much better? I feel that they have mainly changed from sounding soft to sounding focused. Whether or not you will prefer this is a matter of personal preference, and system synergy. Typically I like a smooth, non-clinical presentation, but I also like focus and clarity and don’t like a fuzzy/blurry sound. 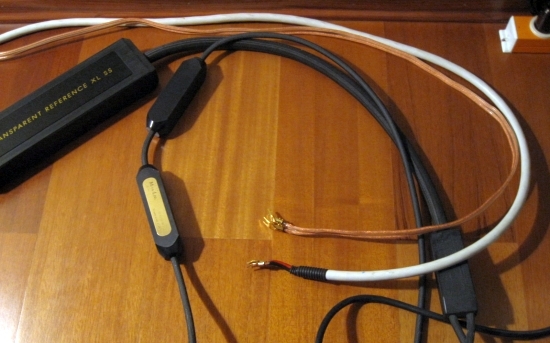 The reason why I am using Symo now is because I have not yet found a newer cable that betters it on all accounts. Same for the vdH that I used with the Divas. What I quite like these days is Jorma Design. I have their most affordable No.3 speaker cable and while not the fullest sounding it manages to sound detailed and precise yet also fluid and relaxed. For the Apogee Centaur Major I would expect it to work well. Thanks, Christiaan, for the informative reply. “If you are looking for a synergistic smooth, tonally full sound” – yes, this is what I’m after particularly since my amps are Krell. I have not heard of Jorma Design – will check them out. Another alternative might be the Italian HiDiamond. Not particularly expensive, but well balanced and very musical. Jorma will beat them in precision, refinement and air but the HiDiamond is fuller and smoother, more like the Symo. After checking the Jorma, it may be a bit more than I wish to spend, so I’m off to read up on the HiDiamond. Indeed termination is a make or break matter with these cables. 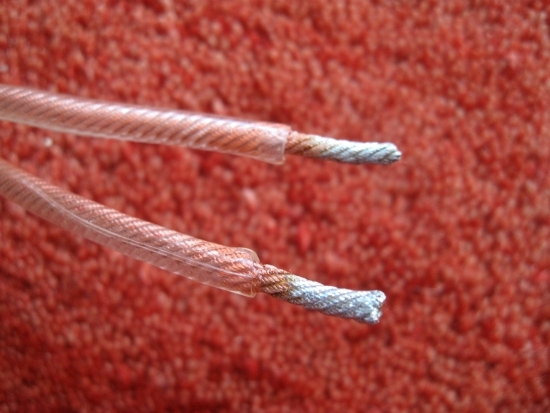 Simply soldering them as normal is not enough to fully melt the wires’ coating. 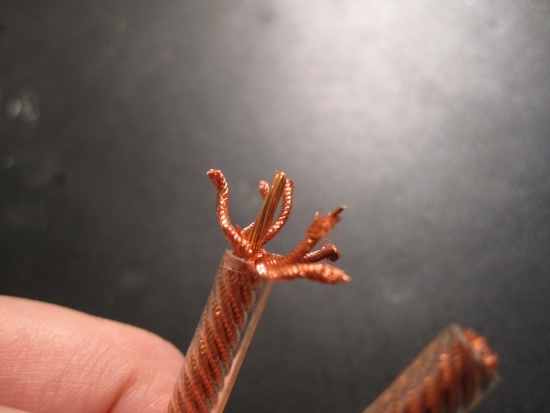 A solder pot is required for best results and not many consumers are familiar with this. Excuse me but to wrote that Symo LS5X sound dull is nonsense. Their midrange is so fuller than bunch of XLOs, AQs, Kimbers ,Transparent and many others I tried on NS-1000M . But when you have such full midrange and if you are familiar with some treble standing out you will surely lack that . Original spades are crap and will fall apart sooner or later. But as all cables some fit some don’t ,ears are yours. When I wrote that the LS5 sounds dull (in my system and under these circumstances) I was referring to the treble. Its midrange is indeed rich and full sounding. Note that the LS4 does not sound dull at all, only the LS5, which may be due to its badly soldered connectors but more likely due to its thick PVC sleeve. The original spades on the LS4 are actually soldered on very thoroughly and seem sturdy enough to withstand even very rough handling. The copper is slightly pliable and so it won’t break under pressure. Actually, for connecting the Gustavson speakers I am currently using the Symo LS4 again because the vDH Skyline Hybrid is too bright with these speakers. The Symo, however, is an excellent match. This proves how relative these things are.